1986 Topps is not a variation-heavy issue from the junk era. Besides Roger Clemens, Tom Seaver and a handful of other common player variations, there isn’t much. 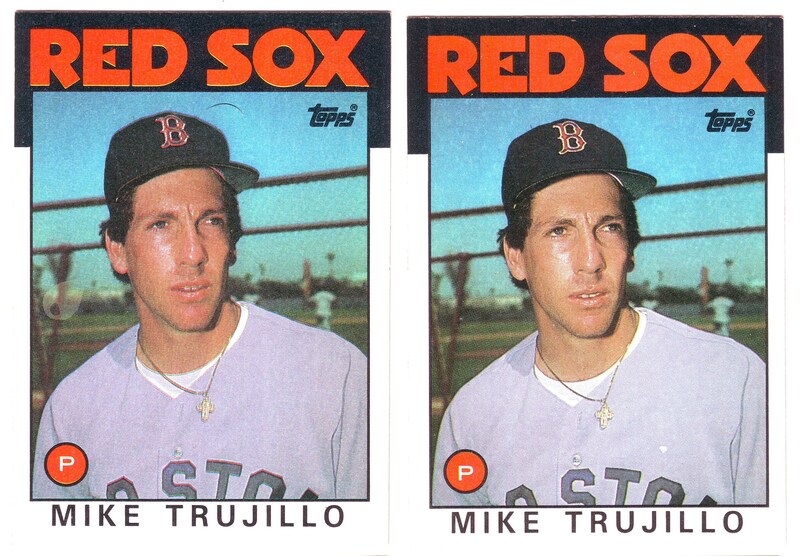 A recent discovery of mine from about a year and a half ago affects card #687, Boston Red Sox pitcher Mike Trujillo. On one version, a teardrop-shaped spot that is missing the black ink appears over his right shoulder. Make no mistake, this is not an isolated printing flaw that I found a couple copies of. In fact, I find the corrected version to be scarcer (9 errors to 2 corrected so far). The recent discovery of this card suggests to me that I should probably be looking a little closer at my ’86s. I have a feeling that like 1990 and 1992 Topps, that there are many more variations to be uncovered. If you don’t mind me asking what are the Clemens and Seaver variations? Absolutely love the site. Both Clemens and Seaver can be found with a large, light-blue swath in the upper border of the card where the team name is. Clemens’ is affected at top right while Seaver’s card is affected at top left. I’d do a post on those two variations but I do not have an image of either at this time. Glad you’re enjoying the site, please keep checking it out! Can anyone help me with a Clemens or Seaver “streak” variation.